In 2015, MYOS RENS researchers in collaboration with scientists at Rutgers University used a mass spectrometry-based proteomics approach to study the changes that take place in egg yolk during the first 24 hours following fertilization and published their findings in Food & Function. Fertilized egg yolk is used in the proprietary manufacturing process of Fortetropin®, the first clinically demonstrated, natural myostatin reducing agent. Chicken egg yolk is a rich source of nutrients providing high quality proteins, vitamins, minerals, carotenoids and antioxidants. Chicken egg yolk, recovered from whole egg within 24 hours post-lay has been utilized as a starting material in the preparation of a dietary supplement that has been demonstrated to lead to gains in muscle mass in a human clinical study. Further, an oil derived from chicken egg yolk has been utilized as a topical agent to treat third degree burn injury. The molecular changes that take place in fertilized, chicken egg yolk during the first 24 hours post-lay are not well understood. By studying how the protein composition of egg yolk varies with fertility status, one can utilize this knowledge to develop egg yolk-based products that have been optimized for specific applications. In this study, a direct quantitative comparison was made between the proteome of fertilized chicken egg yolk and the proteome of unfertilized chicken egg yolk, both maintained at 20 °C and analyzed within 24 hours post-lay. Egg yolk proteins from each fertility state were digested with trypsin, labeled with distinct chemical labels (tandem mass tag reagents) and then combined in a 1:1 ratio. A TMT-labeled tryptic digest derived from chicken egg yolk proteins (fertilized and unfertilized) was separated using high-pH/low-pH reverse-phase chromatography and analyzed using mass spectrometry. 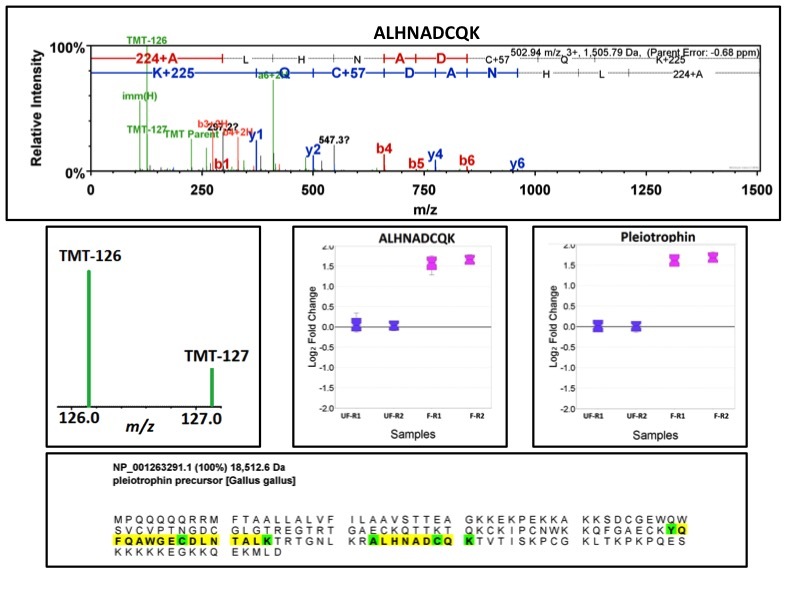 225 protein identifications were made from this TMT-labeled tryptic digest based on a minimum of 2 unique peptides observed per protein. 9 proteins increased in abundance in fertilized egg yolk relative to unfertilized egg yolk and 9 proteins decreased in abundance in fertilized egg yolk relative to unfertilized egg yolk. Some proteins that increased in abundance in fertilized egg yolk play an important role in angiogenesis (pleiotrophin, histidine rich glycoprotein) and defense against pathogens (mannose-binding lectin, β-defensin 11, serum amyloid P-component, ovostatin). Based on this study, fertilized chicken egg yolk may be more useful as a starting material relative to unfertilized chicken egg yolk for the purpose of enriching or isolating proteins with pro-angiogenic and anti-microbial properties.